Reading through J.K. Rowling’s fifth installment of the Harry Potter series, I couldn’t help but think what a great movie it could make. Several hundred pages of nonsense and dullness could be dutifully excised in order to create a tight, exciting movie that focused primarily on on an impressive climax. Fortunately, Harry Potter and the Order of the Phoenix does not disappoint, even if it isn’t a fantastic film. After the return of the evil dark wizard Lord Voldemort (Ralph Fiennes), woefully chronicled in the abysmal Harry Potter and the Goblet of Fire [review here], Harry Potter (Daniel Radcliffe) is back at Hogwart’s for his sixth year. The situation has changed, however, and things are looking grim. No one in the Ministry of Magic believes the stories that Harry and Headmaster Albus Dumbledore (Michael Gambon) have been telling the public; they are too terrified that the stories might be real. But Dumbledore has been working quietly, organizing the Order of the Phoenix to fight Voldemort’s army while remaining under the radar. There are other problems, too. Harry has been seeing terrifying visions in his sleep, and fears that Voldemort might be penetrating his brain with mind-reading powers. Sometimes this is helpful, such as when foretelling threats against members of the Order, but there are fears that the psychic link might be exploited to Harry’s detriment. The is a new figure at the school, one whose presence is not entirely welcome by the staff or students. Dolores Umbridge (Imelda Staunton) has been appointed by the Ministry to teach in a “Ministry-approved” method, one which involves doing very little. 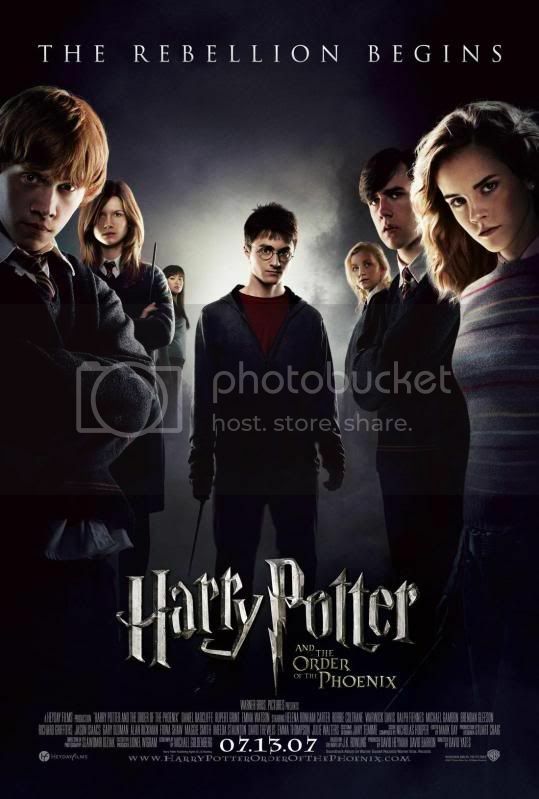 As the year progresses it becomes clear that something must give: Dumbledore and Voldemort move ever closer to a direct showdown, with Harry’s friends Hermione (Emma Watson) and Ron (Rupert Grint) caught up in the middle of the conflict. At the same time, the oppressive regime of the Ministry cannot continue unchallenged, and Harry’s godfather Sirius Black (Gary Oldman) has some secrets to reveal and past demons to exorcise. Hogwarts looks substantially different than in the previous films, thanks to a new director. David Yates (who has been directing the remainder of the series) opts for a more mountainous feel for the School of Magic. His direction is appropriate, allowing the characters and events to occupy most of the screen time. Clever use of newspaper headlines enable the plot to jump forward without taking up too much screen time. Most impressive is this outing’s adaptation of the novel. The first four hundred pages have been condensed to a manageable 30 minutes or so, allowing more time for an exciting finish. The few changes that have been made to the plot are all in service to crafting a better movie. The film’s explosive climax is exciting and well-crafted. By no means does Harry Potter and the Order of the Phoenix attempt to do anything different or unconventional, filmmaking-wise. Some scenes still seem rather contrived, necessary only to provide vital information to advance the plot. The acting has improved, with Radcliffe, Watson, and Grint all more comfortable in their roles. The supporting cast is colorful and enjoyable, with practically every living British actor involved in some capacity. Harry Potter and the Order of the Phoenix is far superior to the previous installment in the series, but by no means the best. It is an encouraging step in the right direction, however, and provides hope for a well-crafted cinematic conclusion to the adventures of Harry Potter. Fans of the series and novels should enjoy the film, and purists shouldn’t be too upset by some of the liberties taken by the screenwriters. I can’t imagine why anyone without some sort of interest in Harry Potter would jump into the series with this entry, but if they did I’m sure they would be utterly lost and confused. This entry was posted in 3 pirate flags, 3 stars, H, Movie Reviews, Pirate Flag Rating, Star Rating on January 25, 2010 by Tim Irwin.